FTP, CPC, cookies, quality score, RSS, conversion rate, googlebot, meta data, etc., etc. In dynamic, ever-changing industries it can sometimes feel overwhelming to keep up-to-date with the latest buzzwords and technical jargon. It seems like every time you get a handle on things, something new and innovative emerges onto the scene. Internet marketing is one of those industries where keeping yourself educated can make or break your success on the web. How many times have you talked to an agency about your click through rate, or cost per impression? It’s no doubt things can get confusing quickly. It’s a business that moves with the times and latest technology. Despite this, grasping the fundamentals of internet marketing doesn’t require a Ph.D in brain surgery. It requires a basic understanding of internet marketing lexicon that can ultimately make a difference in your internet ROI. It’s the understanding that will give you the ability to analyse your web presence, optimize campaigns for greater returns and give you a better overall understanding for all things internet marketing. We know it can be tricky, so we’ve decided to help. The AdLuge team has developed this glossary to use as a reference. In our new eBook The AdLuge Internet Marketing Glossary, we’ve referenced the industry in its entirety. From the most basic fundamental concepts, to the latest, cutting edge lingo. AdLuge has created a simplified, easy to read reference guide that can become your one stop resource to the world of internet marketing. 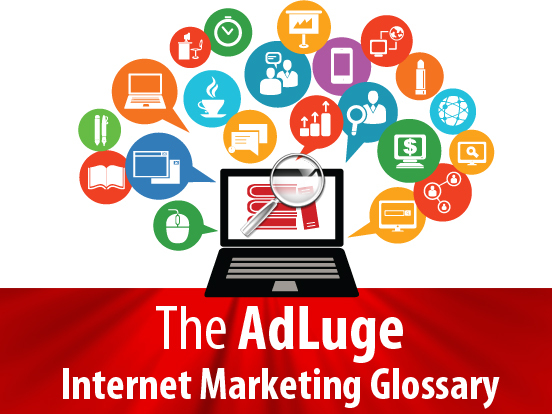 The AdLuge Internet Marketing Glossary, boasts a 37 page A – Z glossary that allows you to reference internet marketing terms right from your computer. This includes a fully clickable hypertext index that provides you with the ease of getting where you want to go quickly. Want to know what multivariate testing is? Just click on “M” in the index to bring you exactly where you need to go. The information is easy to comprehend, well-written and extremely valuable, providing you with portable and convenient access to resources that can assist your business. If you’re new to internet marketing or if you just need to brush up on industry terms download our helpful eBook glossary. Just head over to AdLuge to download and get started. Get in the know with AdLuge and get up-to-speed today! Thanks for proving this resource to readers such as myself. Many times the “alphabet soup” and technical jargon tends to be overwhelming. I have already found this glossary to be quite helpful to understanding more about the web. Wow. I didn’t even have books this helpful in college… and it’s indexed by letter, too?! Thank you so much for putting this together. The lingo can be overwhelming… this is so enormously helpful. Thanks Commander! Keep an eye out for our next ebook at the end of the month. That’s a really awesome share, kind of you to offer it for free. Actually might be useful to send to clients just as a rough overview, particularly if they are not technically savvy or completely intertwined within the lexicon of the industry. This article is appropriately titled. Unlike some others that I’ve come across, this Internet marketing guide is actually quite extensive and well written. Thank you for making your glossary available to your readers for free.